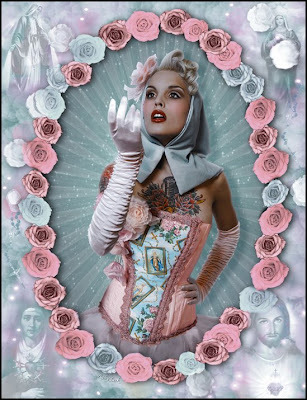 Again, Candela_Inlove has turned me on to yet another corsetmaker in sunny Spain, Bibian Blue Her gallery of digital painting photos is magnificent and a truly inspiring variation on the corset . . . . 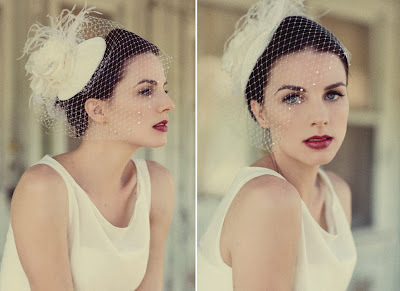 Wanted to share this gorgeous headpiece from Batcakes Couture with you today. 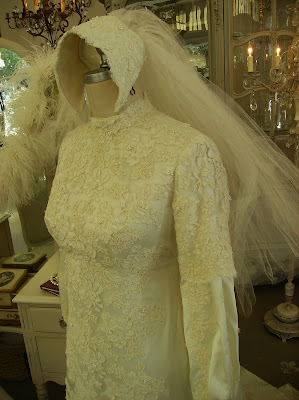 I'd say the fascinator is that hybrid between hat and veil so many brides are looking for and finding tres chic . . .
For me blue has a medicinal effect of calming and soothing. These have been some of my favorite photos now combined to inspire . . . .
July is Vintage month and we're starting our journey into this packed subject early. I'm fortunate to live in San Anselmo, christened by some as the antique capital of California. 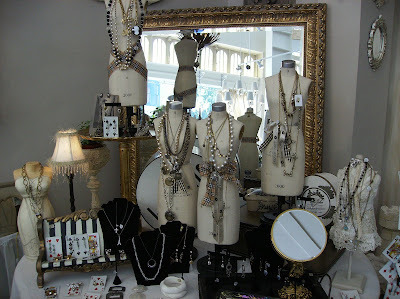 One of my favorite shopoholic stops here is French Nest, a vintage furnishings and accoutrement's store run by two bright and talented women, Holly Hopper and Silke Solomon. 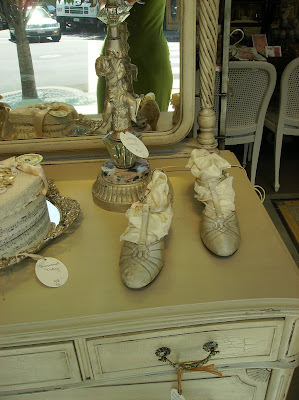 Amid some gorgeous country French style furnishings you'll also find vintage hats, shoes, jewelry and dresses. 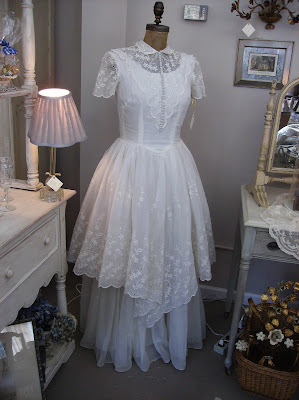 Once I laid eyes on these actual vintage frocks, I just had to share them with you. I was taken by the eyelet organdy on this late 1940s gem. I can't find fabric like this and I've been looking allover. 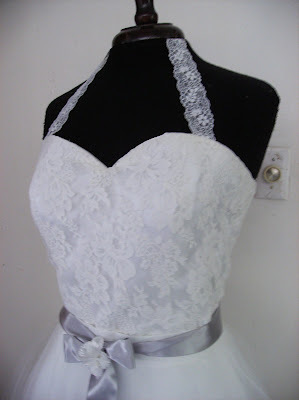 The quality is unbelievable and at closer inspection the dressmaking techniques impeccable. 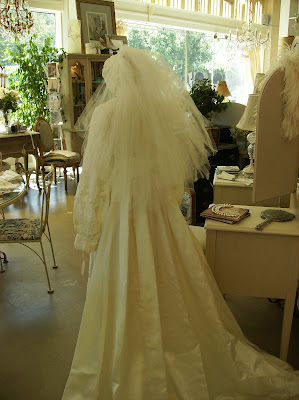 Also this dress is totally intact-- no rips, yellowing or stains. The former owner must have packed it away with the utmost care for years. 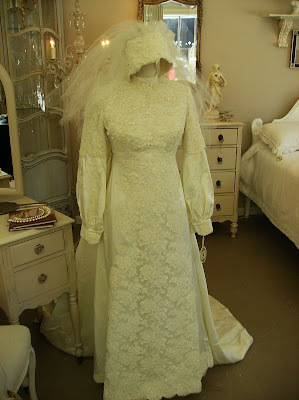 The dress above is a perfect example of mid-seventies and what traditional bridal wear looked like the years between Trisha Nixon and Lady Di's wedding. We often think of the seventies as funky-funky and it certainly was, but remember bridal wear took a long time to move out of the restricted zone of high collars and long sleeves only and into the realm of high-fashion. Both these dresses are under $300.00. 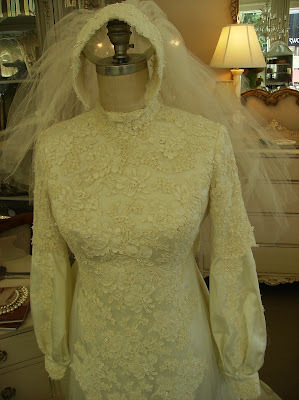 Given the amount of lace and exquisite fabric, going vintage here would be a real bargain. 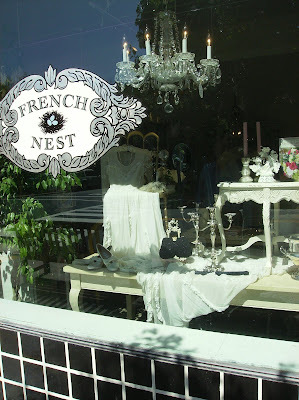 If you're lucky enough to live in the San Francisco Bay Area, stop by French Nest at 500 San Anselmo Avenue in San Anselmo. If you're planning a visit to the area, definitely put this one on your itinerary. 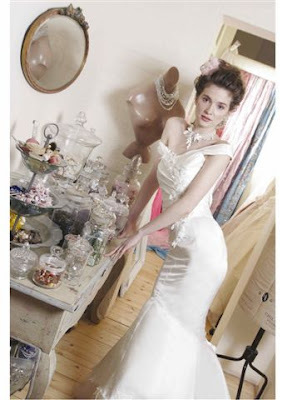 If you've been following Bride Chic, you know by now June has been dubbed corset month and we've been around the world checking in with all the designers. Wrapping up the topic, I saved some of the best for last. Today we'll meet Joan Shum. 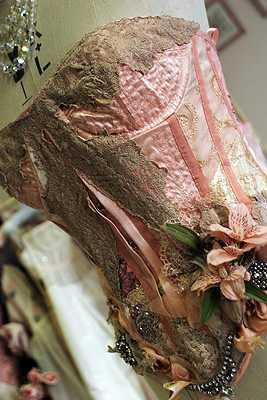 Though this Long Beach, California designer doesn't specialize exclusively in corsetry, she certainly has a few stunners in her collection. 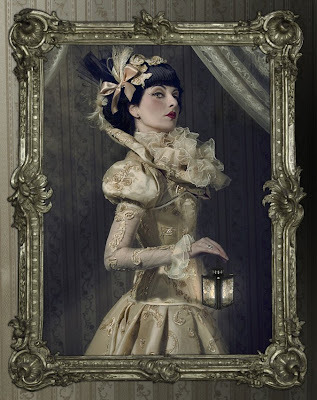 Inspired by art and costume, she's added these and others to her design repertoire. Below are some of my personal favorites. . . . . Some of the most gorgeous photos and a real 'feel good' place to pick up some unforgettable inspiration is on Stephanie Williams blog. A dear friend of mine over at Styrous® shot the last two photos here last weekend; it's the newest addition to the 'Dioresque Collection'. 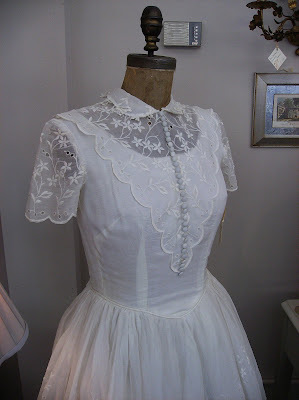 Once this 1950s repro slid off the work table, I purposely gave it the vintage name, Debbi. 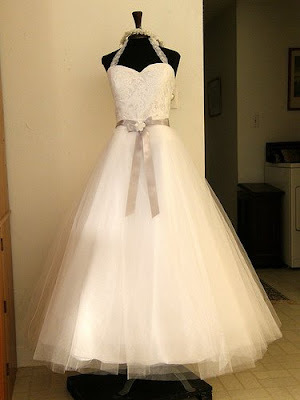 The just-above-the-ankles skirt is three layers of white tulle and the sweetheart bodice is made of an allover Chantilly lace. I think my new signature is definitely satin tie belts adorning the waist. Debbi is actually separates. 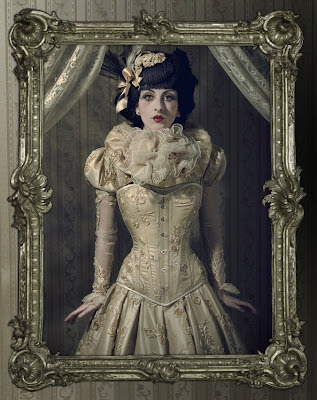 The bodice can be worn tucked in as shown or as a dropped waist. After the wedding? Wear the bodice with blue jeans if you want. And think of the possibilities you have with the skirt . . . . Pair it with a black halter and you have a spectacular evening ensemble. 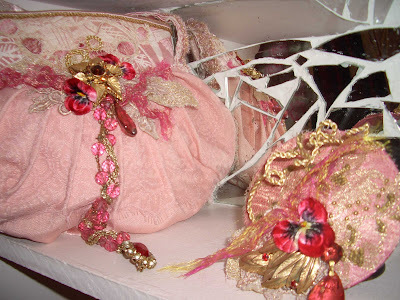 Candy over at Candela_Inlove emailed me a link from this wonderful designer, Maya Hansen. 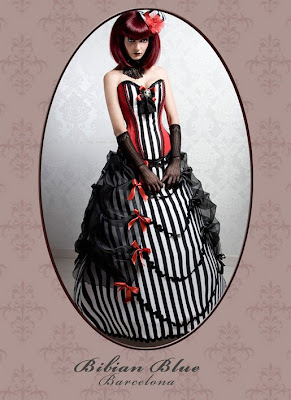 Maya specializes in corsets of all kinds from bridal to tutus to fantasy and her site is definitely worth checking out. . . 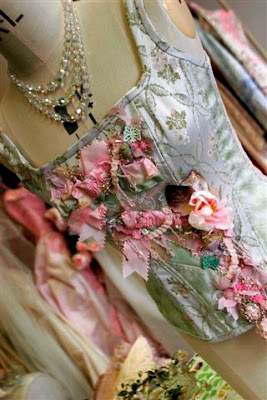 SOME LUCKY FLOWER GIRL . . . .
Every so often I run across an extraordinary piece. 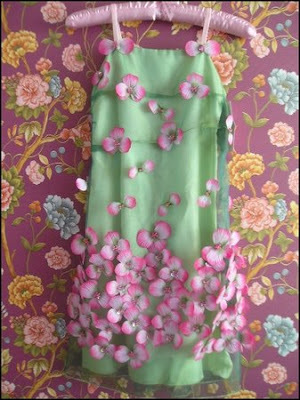 Unfortunately I can't share who did this flower girl dress because I found it on Project Wedding and it's origin is unspecified. It looks like someone took a basic pattern and scattered artificial flower petals with rhinestone centers all over. What do you think? Custom designer or somebody's highly creative grandma who has some serious talent way beyond the 'cutsey' stuff. Martha Stewart, eat your heart out . . .
Terry has one of the most interesting design backgrounds. 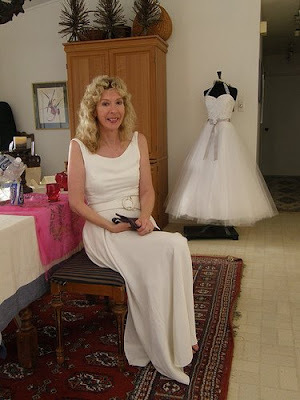 She apprenticed and learned couture techniques from Zandra Rhodes and The Emmanuels (Princess Di's wedding gown designers). From there she developed a style and launched her own special occasion line selling to Harrods of London among other high end stores. 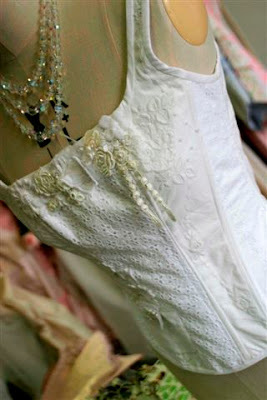 I ran across Terry Fox's creations once again on Brides UK finding a couple of her corsets featured. Not long after, on a UK chat board one bride recommended Terry to another as a corser-maker extraordinaire. Eventually Googling Terry's new site. 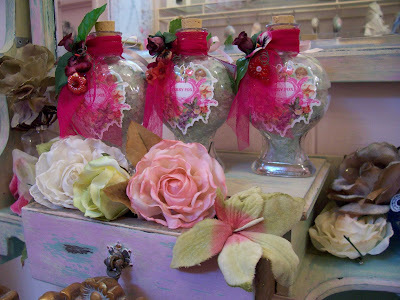 these Oooooh La La creations were found. . . . .
HAS CHRISTIAN LACROIX GONE BUST?